As fundraisers we know how important private support is to advance any organization. The AFP San Diego chapter is no different. Our chapter dues and registration fees help fund our regular operations. 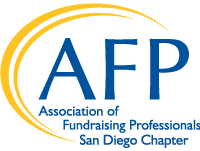 But important educational opportunities such as fellowships and scholarships, SNAP (for senior level fundraisers) and other special events can only continue with private support from you and other San Diego Chapter members. Please consider making a contribution and help us reach our $4,000.00 goal for the 2018 BE the CAUSE Campaign. Please invest in the people and programs of our chapter by making a gift to the campaign. The BE the CAUSE Campaign will allow us to raise the funds necessary to continue to grow and support our chapter member benefits and services. The funds raised will be invested back into programs and services that benefit YOU – our valued member. Please make your gift today by going online, click here.